The TASER XREP, the eXtended Range Electronic Projectile, delivers a self-contained, wireless projectile with a shocking payload. Fired from a standard shotgun, it delivers neuro-muscular incapacitation just like a taser - but at much greater distances. The TASER XREP can be used at up to 100 feet from the target. The XREP comes pre-packaged in shell that is compatible with existing 12 gauge launchers. The transparent shell ensures officers properly identify the XREP prior to loading it in the shotgun. As the TASER XREP is deployed, a rip cord attached between the shell and the projectile activates the projectile. Once activated, the TASER XREP is “live” as it comes out of the barrel. The XREP autonomously generates incapacitating Neuro Muscular Incapacitation for 20 continuous seconds -- enough time to close the distance and take the offender into custody without risking injury to officers. Not only does the XREP incorporate a revolutionary electronic payload, the XREP also incorporates a radical new spin stabilization technology to maximize accuracy. As the XREP leaves the barrel, 3 torsion spring fins deploy, causing the projectile to spin, even when launched from a smooth bore, providing superior accuracy and flight stabilization. The TASER XREP launch velocity is approximately 300 feet per second. The nose assembly of the XREP contains 4 forward facing barbed electrodes and the collapsible electrode cowling. On impact, the forward facing barbed electrodes attach to the body of the target. 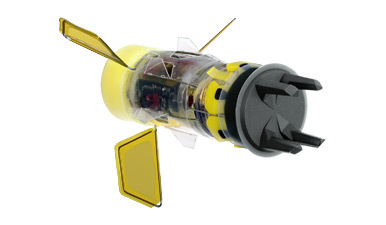 The energy from the impact breaks a series of fracture pins that release the main chassis of the XREP which remains connected to the nose by a Kevlar reinforced fiber. As the chassis falls away, 6 cholla electrodes automatically deploy. Named after the famous desert cactus, the cholla electrodes penetrate clothing to deliver the TASER XREP’s powerful NMI over a greater body mass. If you think you've seen this idea before, you're right. And it's an old one. In his 1875 classic 20,000 Leagues Under the Sea, Jules Verne wrote about a "leyden ball" that could be used for hunting. "Sir, on the contrary, with this gun every blow is mortal; and, however lightly the animal is touched, it falls as if struck by a thunderbolt." "Because the balls sent by this gun are not ordinary balls, but little cases of glass. These glass cases are covered with a case of steel, and weighted with a pellet of lead; they are real Leyden bottles, into which the electricity is forced to a very high tension. See more details at the TASER XREP website.